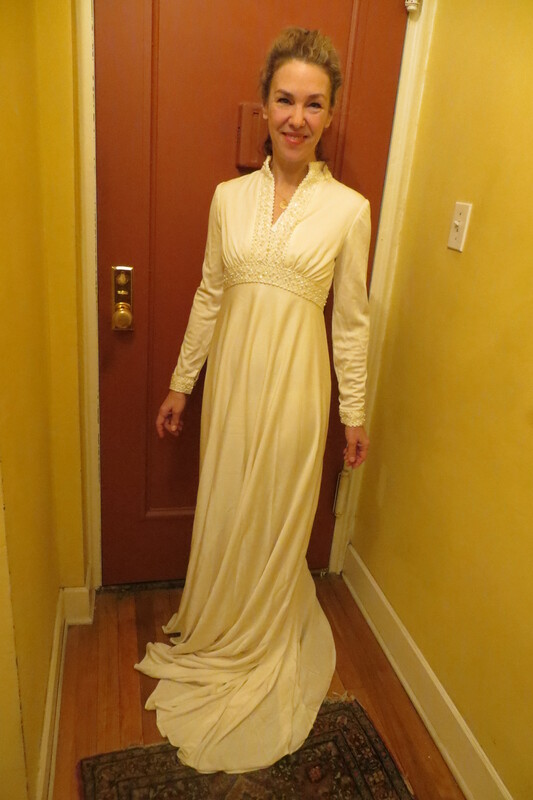 Today I am taking a 70’s (I think) bridal gown and reinventing it into a new 2015 evening gown. But, honestly, what can one do with a long, white gown that screams “Bridal”? Face it, you will never wear it again-that’s why I could pick it up at a thrift store for $14.99. Score one for me! Initially I think I will try to turn it into a Regency gown ~ the time of The Dressmaker’s Duke. If I did I could keep it white and would not have the headache and possible failure of trying to dye the thing. 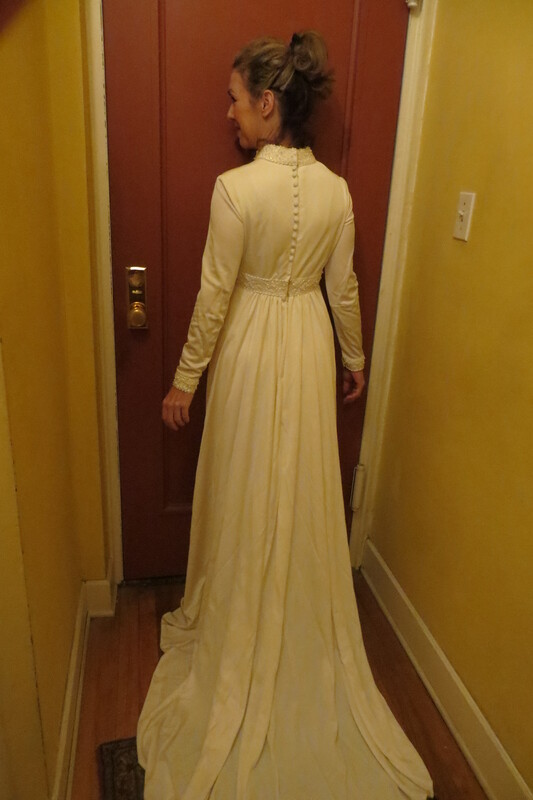 But, I bought another wedding dress at the same time I bought this one and I think the other will be a better fit for the Regency gown project (coming soon). So I begin to look at this dress as something I can actually wear someday. I decide to remove the sleeves (I will turn them into long evening gloves in another project.) 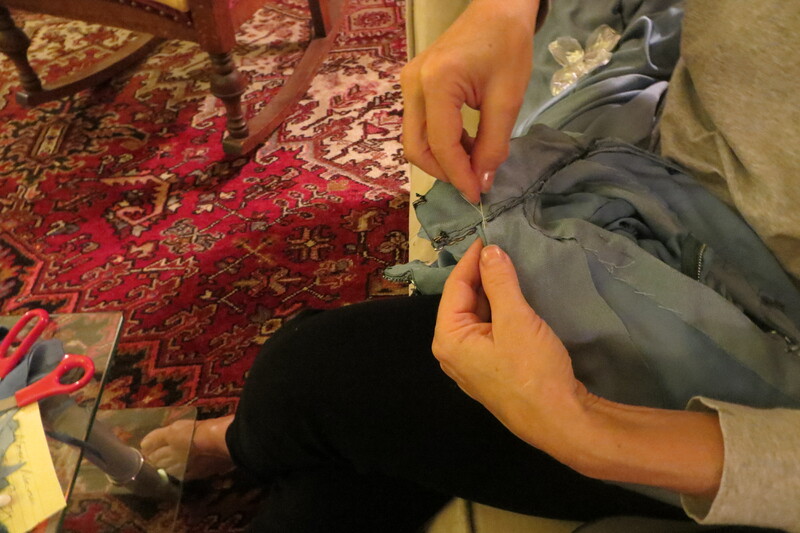 And I take the shoulder seam out altogether, ripping it right up to the neckline. 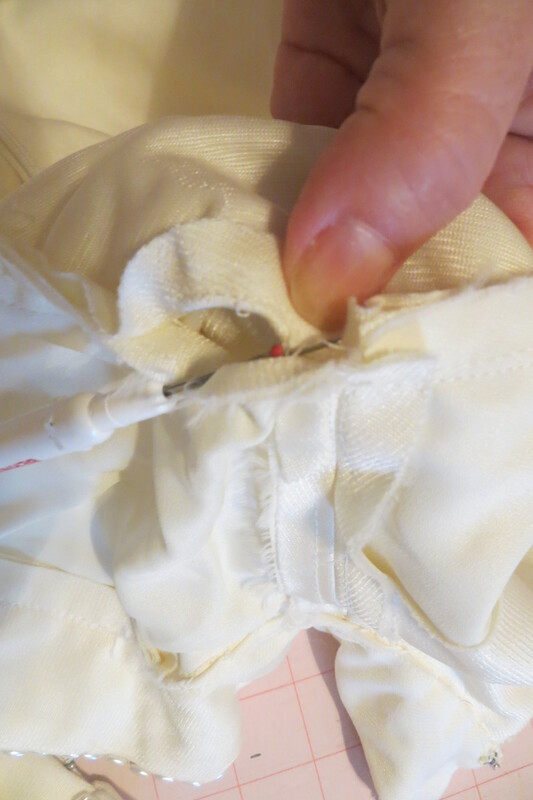 Next I remove all the buttons from the back and take out the zipper from the neckline to the waist embellishment. 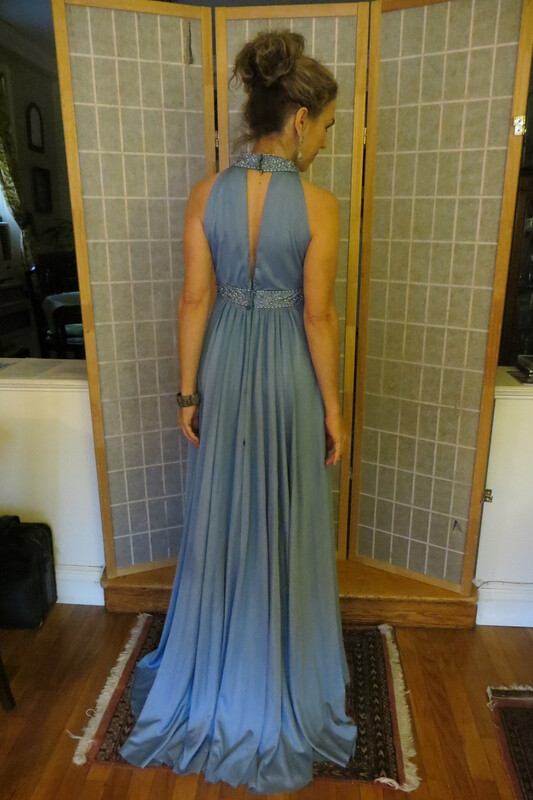 I decide I want the back to mimic the front with a slight “V” opening. HOWEVER, it is still WHITE. Still very BRIDAL. 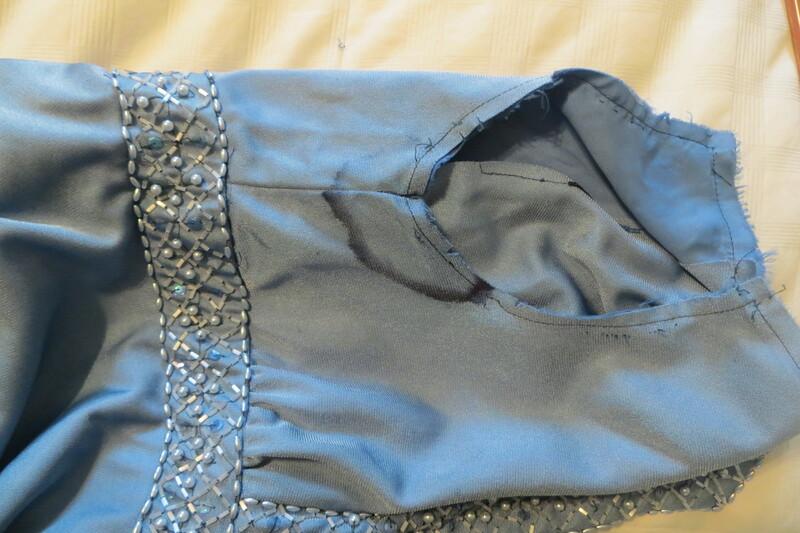 So, in for a penny, in for a pound, I decide to dye the dress. Fingers (and toes) crossed! I am not sure what this dress is made of–something man-made for sure. I take a snippet of fabric from the selvage in a seam and see if it will take dye. It does, though when I rinse it becomes appreciably lighter. 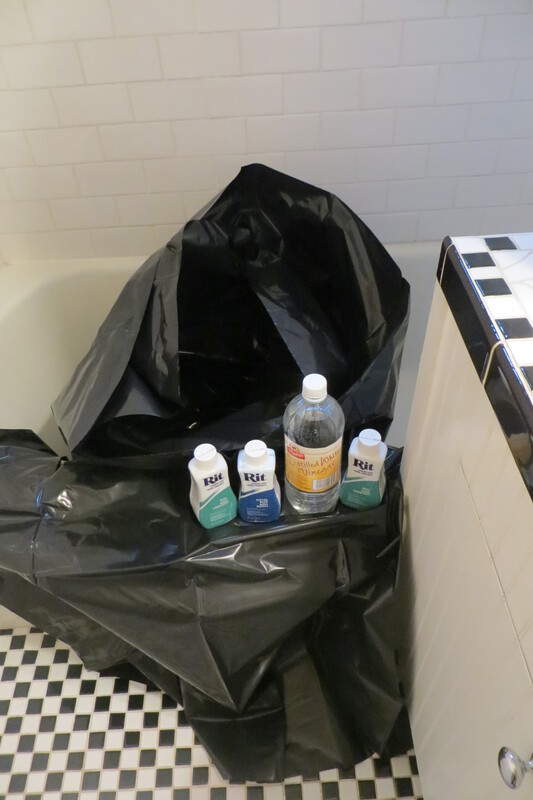 Using heavy duty trash bags, two bottles of teal and one of royal dye, a bottle of white vinegar, and very hot water, I prepare my dye bath in my bath tub. Moment of truth! In goes the gown. I make sure it is saturated and then tie the bag up. I agitate the bag every so often so that nothing settles too long. I fill the tub around the bag with hot water and let it “cook” for several hours. Real moment of truth… I pull the dress out of the bag. It looks pretty darn even! 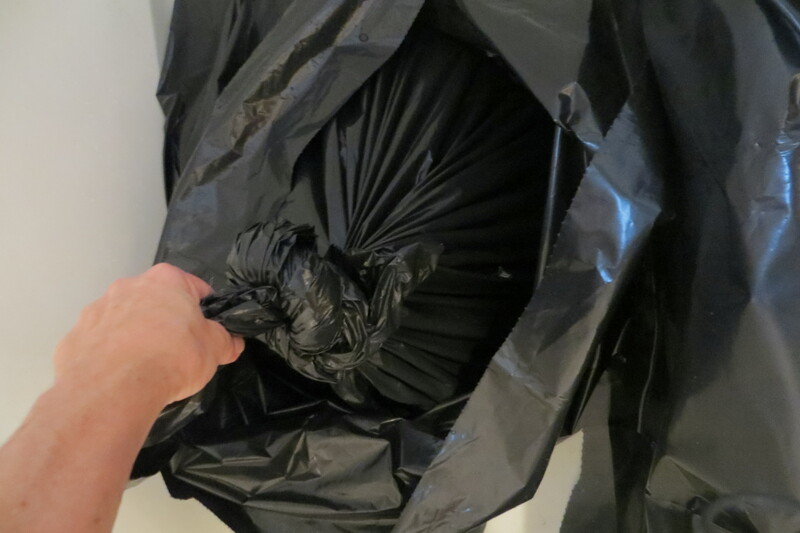 I hang it on the shower head and let it drip into the trash bag. Then I notice something BAD. Sweat stains under the arm pits. Ugh! OK, (I take a breath) and remind myself this is what makes these projects challenging. My mind begins to whirr with possible solutions. 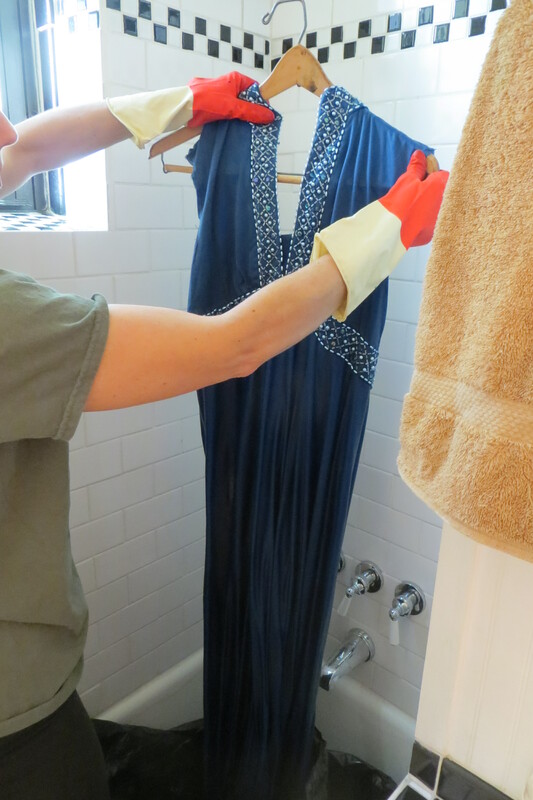 I rinse the dress in cold water several times and let it dry. 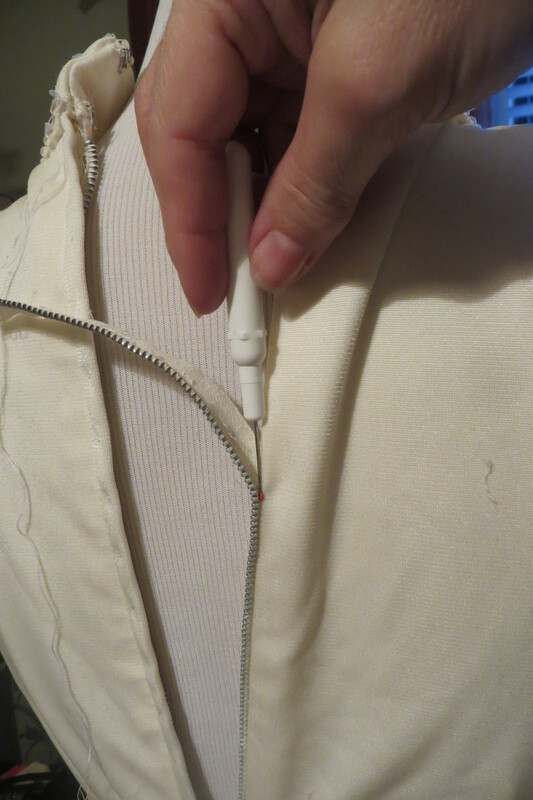 Then I hand stitch the new armholes and the “V” back. 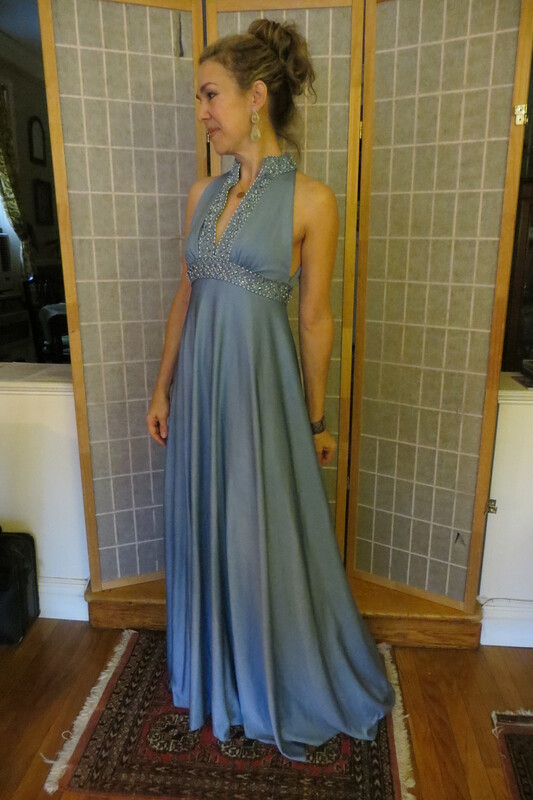 I play around with some sort of embellishment at the hem line, (silver flower petals) but I really don’t think the dress needs it. There are no stains or flaws to cover up. (I have done this on the dress below. It looked as if a cat had gotten hold of it. 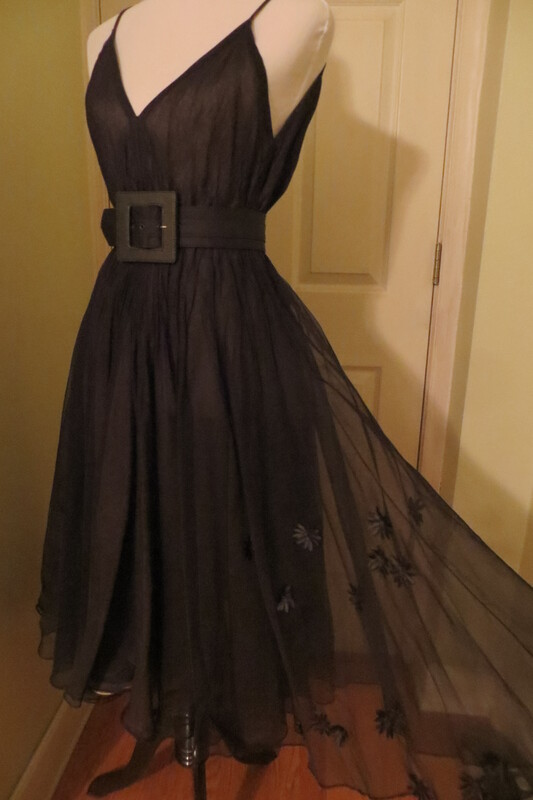 Lots of pin-hole tears in the organza skirt. I simply sewed tiny silk flowers over every tear. Once again, A BAD thing made GOOD! 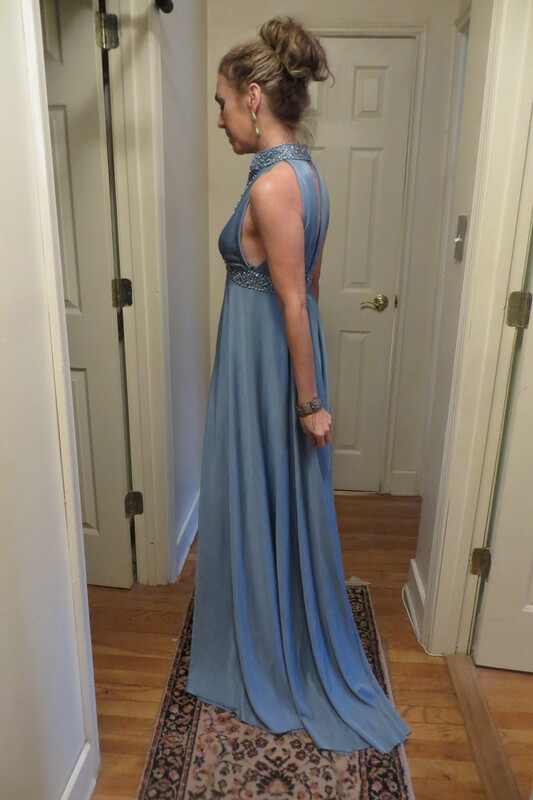 So, here is my finished dress! What do you think? BTW, The Dressmaker’s Duke will be Five months old on February 26th! And starting on the 20th it will be on SALE for .99 cents!! But only for two weeks so please take advantage and pick one up or gift one to a friend! Also, I have 93 reviews! Thanks to everyone who reviewed. I would love to get 100 by the end of this month. So PLEASE, if you haven’t written a review, would you take a moment to do so? If you need help with posting, please give me a shout! Next month’s Trash to Treasure is March 10th! 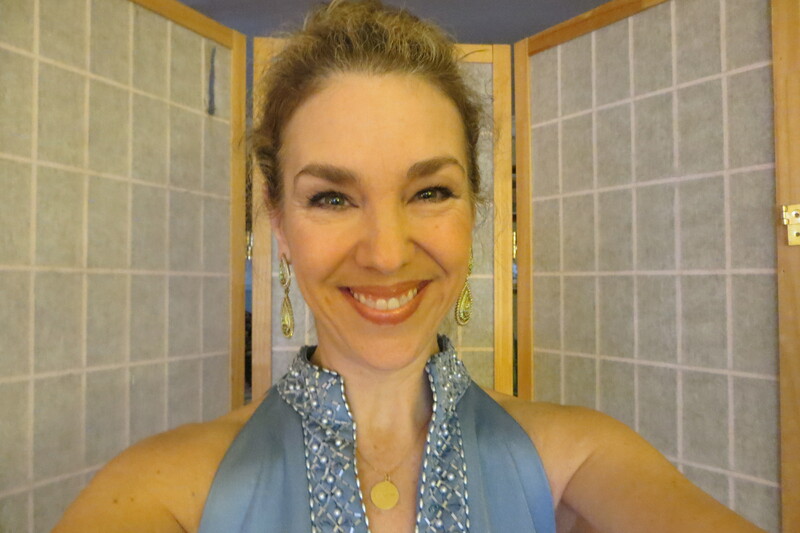 This entry was posted in Jess Russell, Regency author, romance and tagged best seller, gown, hand-made, Jess Russell, Regency, sewing, The Dressmaker's Duke, Thrift store, Trash to Treasure, vote. Bookmark the permalink. The new dress looks red carpet ready! Love it! Thanks, Jack! What’s more it is comfortable! Jess, Unbelievable! We need to get you on a morning show or the afternoon Meredith Viera. Who has contacts?? ?